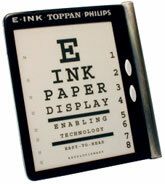 Lightweight, high contrast, high resolution digital paper displays are getting closer. This time ebook readers are going to be huge. The benefits of digital paper displays over LCD displays will solve many of the usability problems with earlier ebook readers. What are the financial ramifications of removing the dead tree bits from the newspaper publishing business? Various sf authors have written of these wondrous devices in the past; unfortunately, they were forced to transmit their words to us on dead tree bits. See Philips Rollable Display - Science Fiction in the News at http://www.technovelgy.com/ct/Science-Fiction-News.asp?NewsNum=34 in the News for more links and details.